How to Integrate Jobvite ATS with Teamable. When Jobvite is integrated with Teamable, Teamable automatically synchs your company's jobs and job owners to Job Lists and pushes candidates who have been emailed or passed back to the recruiter to contact. Teamable also has a listener to obtain the latest status on any candidate and display it within Teamable. You will also need to ask Jobvite support for the GET EMPLOYEES key permission. Once you have them, log in to your Teamable Admin account. If your keys have the permissions, you will get this message. Click CONTINUE WITH CONFIGURATION. Now choose who you want to be your Default job Owner in Teamable. This is who owns the job in Teamable whenever the person who is the primary job owner in Jobvite has not created a Teamable account. Click SAVE. Jobvite configurations are now processing. You will receive an email when the Jobvite integration is activated. Now you will need to create some custom fields in Jobvite. Note: this requires Admin access to your Jobvite instance. In the Admin view, click on Engage>Custom Fields. For Name type ‘Teamable Notes and Messages’ (without single quotes). For Internal Name type ‘teamable_notes_and_messages’ (without single quotes). Figure One: Adding Custom Field in Jobvite. Next, you will create a custom source in Jobvite. In the Admin view, click on Configurations>Sources>View Sources. Type in 'Teamable prospect' (without single quotes). Teamable uses this source type to mark contacts created as a result of social referral. Check Display on career site. Make sure radio button 'Can contain subitems' is checked. That's it! Teamable will now synchronize with your ATS approximately every half hour. To create a new requisition in Jobvite, click on Requisitions>+Add Requisition. Make sure to choose ‘All Employees (Internal)’ or ‘Everyone (External)’ for the posting type in order for it to be picked up by Teamable. Go to Teamable and source warm intros. Note: If you change the name of the job and update the req, it will be updated in Teamable as well. Job update tasks run ~60 mins, so every change related to jobs in Jobvite will show up in Teamable within an hour. Figure Two: Adding new Requisition in Jobvite. Figure Three: Seeing Jobvite role from the Job Lists in Teamable. When a candidate message is sent out by an employee to a prospective candidate from Teamable, or passed back to the recruiter to reach out to directly, Teamable pushes that prospective candidate and any notes on Teamable activity, including the message to the candidate, to Jobvite. In Jobvite, the prospective candidate will become a contact, findable from the pipeline view. Simply search by name to find the candidate. Click the name to see complete details on the candidate. In the example below, this is a new prospect with two notes. If you click on Notes, you will see the notes from Teamable that were created when the prospect was pushed to the ATS. 2. To add the prospect to an existing requisition, click the ‘+ Add to Requisition’ button. Choose the requisition and click select. The contact is now an active candidate for the requisition. 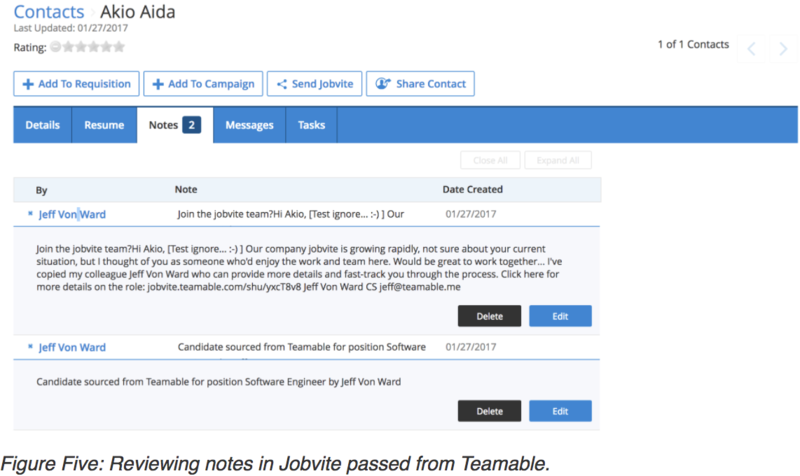 Teamable has created a listener that will update the status of the candidate as he or she moves through your Jobvite funnel.